Shane & Rahndi: First Official Snow Fall! Levi up warm and head out for some play time. 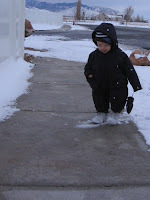 It was so cute, all he would do was shuffle through the snow.